L'Occitane Cade Shaving Cream is enriched with purifying and invigorating organic essential oil, protecting shea butter and moisturizing vegetable-based glycerin. 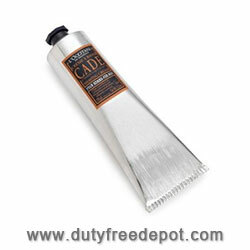 Upon application, L'Occitane CadeShaving Cream turns into a creamy lather giving an extra gentle shave. Your skin will be clean, smooth to the touch and lightly fragrant.